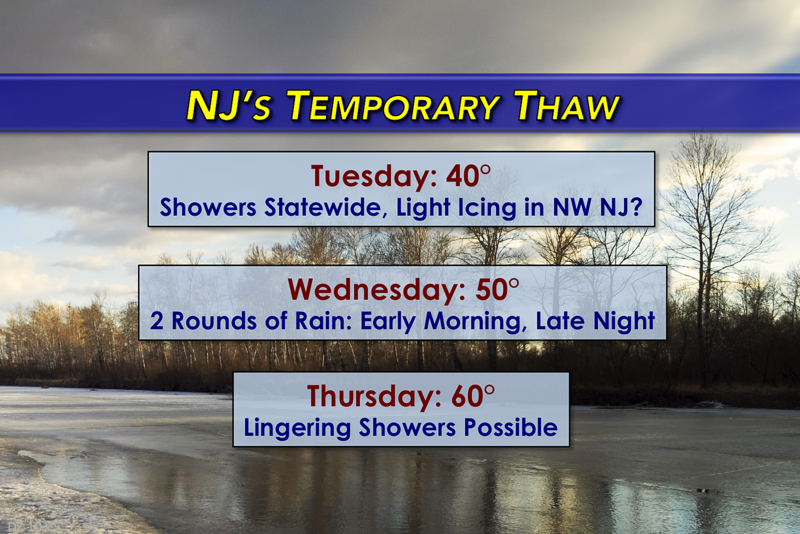 Yes, 60 degree weather is just two days away for the Garden State, but we also have some wintry and wet weather to deal with this week. I don't know about you, but I'm getting pretty sick of this teeth-chattering, bone-chilling cold! The good news is that the next three days will feature a big warmup for New Jersey. The bad news is that these three days will also be a bit unsettled, with some wintry mix on Tuesday and another round of rain Wednesday night. Even though Tuesday morning lows are in the single digits - again - thermometers will bump to around 40 degrees for most of New Jersey by Tuesday afternoon. Above freezing for the first time since late last week! It's not going to be a pretty day, with clouds quickly taking over the sky again. Additionally, a few waves of light snow and/or rain showers are expected during the day, but shouldn't amount to much for most of us. However, the northwest corner of New Jersey will be a bit colder today, with highs only in the mid 30s. So, a bit of snow and ice could accumulate Tuesday into Tuesday night. I'm not concerned about snow. The bigger problem would be freezing rain laying down a layer of ice on the ground. As you probably know, ice is slippery - so things have gotten a bit slick in North Jersey late Tuesday. In fact, the National Weather Service has issued a Winter Weather Advisory for Hunterdon and Morris counties from 11 a.m. to 10 p.m. Tuesday. Sussex and Warren counties fall under a Winter Weather Advisory from 11 a.m. Tuesday to 2 a.m. Wednesday. I don't necessarily agree with the timing and context of these advisories. But again, the threat of ice is present, and that's what spurred them. A warm front will push a line of rain through New Jersey early Wednesday morning, from about 10 p.m. to 7 a.m. That rain is expected to be steady for a bit, with some locations receiving over a quarter-inch in the rain gauge by sunrise Wednesday. Following Wednesday morning's rain, we'll continue the warming trend. Highs on Wednesday are forecast to reach the upper 40s to lower 50s. Even though skies will be mostly cloudy, the day will be mostly dry and winds will remain relatively light. We should get some good snow/ice melt Wednesday, and it doesn't look like a terrible early January day. Another round of rain associated with another warm front will push northward through New Jersey Wednesday night through Thursday morning. A tenth to a quarter of an inch of rainfall is expected. This week's warmup peaks on Thursday, with highs in the upper 50s for the northern half of New Jersey and lower 60s for the southern half of the state. That'll be just a few days within record highs for the date. The only problem is that I can't rule out lingering showers at some point on Thursday. I'm really on the fence between a "breaks of sun" and "periodic showers" forecast - that will obviously be the difference between a beautifully mild day, and a disappointingly damp and mild day. Ah, winter. You had to know that the warmth wouldn't last long. The transition back to cooler temperatures will begin as cold front arrives sometime on Friday (morning according to the NAM, midday according to the GFS). That front looks moisture-starved, so I don't expect much (if any) precipitation to fall. Our high temperature on Friday will happen in the morning, close to 50 degrees. And then temperatures take another tumble, with lows over the weekend only in the 30s. We're still tracking a weekend storm system that will present a chance for statewide accumulating snow. At the moment, models show this system in the Saturday night-Sunday morning time frame. I could see snow totals on the order of 3 or 4 inches. But let's wait a couple more days until we add more resolution to this potentially wintry forecast.